Mom, is there any GOOD STUFF in here? Sweetie, some guys from the lab want to have a party, just a little one. What do we have for appetizers? She’s not eating meat anymore–well, maybe sausage, but not pig-sausage. Ten people from the social justice group will be coming by post-conference for dessert. Your apple cider cornbread is scrumptious! The church needs platters of cut-up vegetables for a funeral reception. His unemployment check is late this week; do you have a couple slices of bread for the kids’ sandwiches? Yes, a vegan birthday cake–how about that carob one with peanut butter frosting that you made for last year’s party? Oh, and some of the kids can’t have wheat. I loved meeting people’s food needs. And I still do. But I had a different life before; my personal food requirements have changed, even though my buying and supplying habits have not–yet. Hence the recent challenge to make dishes with what I have in the house, and then face the world empty-handed, empty-casseroled. Don’t get me wrong–vegetarians, vegans, and omnivores still visit; I welcome the gluten-intolerant, yeast-free, soy-sensitive and low-fat, the teenager-like appetites, but also smaller appetites as well. Tasty comestibles invite people to come and relax, and I want to create a comfortable place for not only myself but others as well. However, it’s crazy, even as a personal chef, even as someone who likes to cook to special dietary needs, having this much food around. For example, I discovered that I had all the fixings for a recipe out of an old Country Living Magazine, involving leftover Thanksgiving turkey and half a pound of phyllo dough. The other half-pound of phyllo went into baklava –for which I also happened to have all the ingredients. A little ridiculous, but indeed, I am the kind of person who often has phyllo dough (and a thousand other odd ingredients) in the freezer; I respond to any possible incredulity–well, I might have a spanakopita emergency! When I mentioned this at a writing group recently, thinking I was the only crazy one there, four out of four of us had the makings at home, at that moment, for spanakopita (spinach pie with feta). Along with ingredients for Indian curries, pesto, and multiple varieties of soup. So does that just mean we are all foodies? Or that amazing numbers of people are now conversant with multicultural foods? Or do all four of us happen to regularly host huge numbers of last-minute get-togethers? Some or all of those theories might apply, but it’s bigger than that. We women are taught to have plenty, to be plenty. We are called on to make miracles with what we have on hand, so we learn to have a lot on hand: in our pantries, in our emotional capacities, in our organization of tasks large and small, in our intellectual understanding and knowledge of the world. We utilize our reserves over and over again, often struggle to keep a brave smile, a “full pantry” all the time, without opportunity for rest and rejuvenation. In performing my usual writerly vocabulary-check I asked: For my title, does “preparedness” differ from “being prepared”? The dictionary answered: Preparedness is the state of being ready, especially for war. Ah! so this is like war for the keepers of the larder: under attack, scarcity approaching. Apparently, this incipient battle requires phyllo dough at-the-ready. And guacamole and salsa and four kinds of crackers for the various demands that might present themselves. Humus, tabbouleh, pita chips. Chicken, hamburger, mozzarella, edamame. And ingredients for phyllo poultry pot pie, and baklava. As a belt-and-suspenders person the message is: be ready for emergencies, don’t be caught unaware, unready, especially if you know it is a possibility–and so many bad things are a possibility. Lately I am learning instead: Yeah, I’ve had it scarce, but I am learning to trust if the world falls apart, my community and I will work it out. I’m prepared but don’t need to live in a state of fearful preparedness. I am acceptable with my hands empty; I will not go hungry. In addition, I can choose when and where my arms are open and gifts are shared, to choose without incurring exhaustion or potential resentment–claiming my right to decide what I want to offer, and when. Even though it is tasty and fun–I don’t always have to have phyllo dough in my freezer. 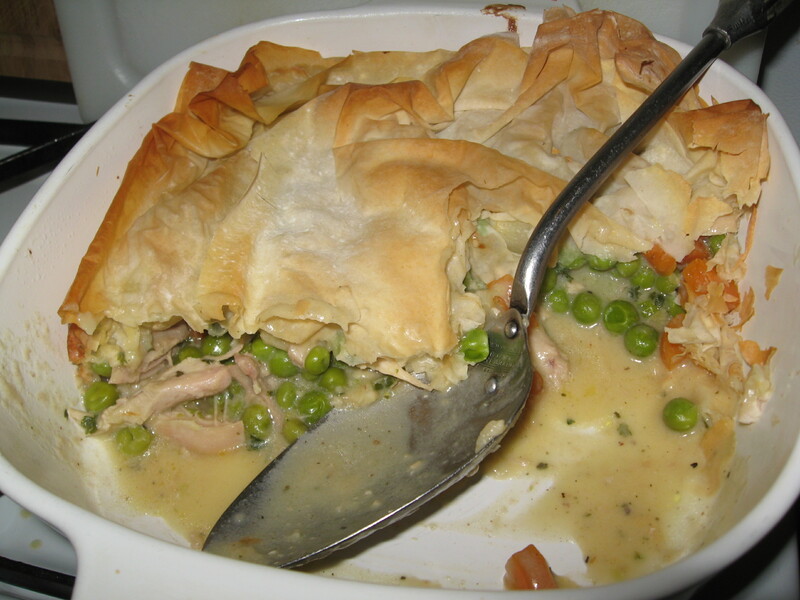 Chicken (originally Turkey) Potpie with Phyllo Crust, adapted from Country Living Magazine, November 2010, page 112. I cooked in a large skillet over medium heat: splash of olive oil, 10 oz fresh pearl onions (boiled for 2 minutes and plunged into cold water for two minutes so you can cut the ends and squeeze out the center portion without hand-peeling), cooked them until golden brown, about 8 minutes. Added 3 community garden carrots, diced, and garlic from the fridge. 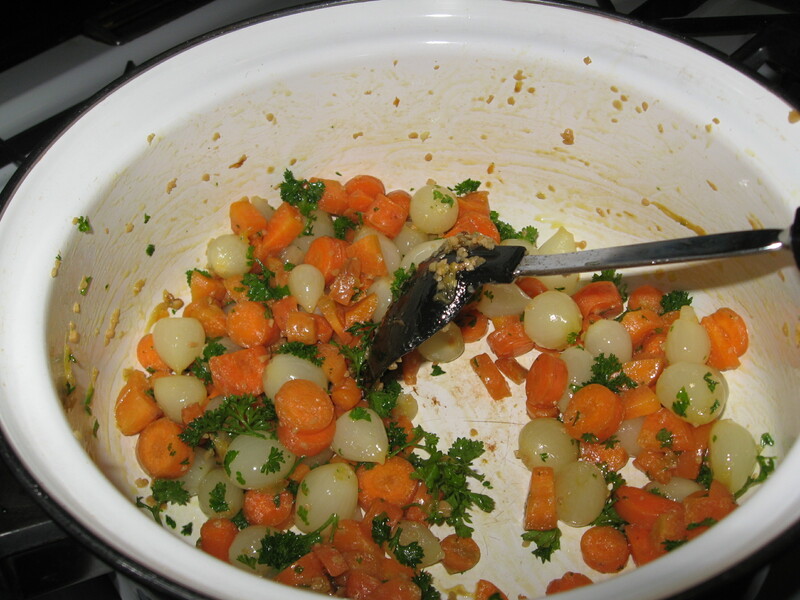 I cooked all that about 5 minutes, until the carrots were just tender, and stirred in a handful of community garden parsley. Sprinkled vegetables with 3 tablespoons of flour and cooked a little (the original recipe called for flour to turn golden brown, but it was too easy to burn it). I added 1 1/2 cups chicken broth–made from chicken pan drippings (including Pappadew seasoning, salt, pepper, garlic, olive oil) AND a cup of 2% milk, a squeeze of spicy brown mustard (the original recipe called for Dijon, didn’t have it, oh well), salt and pepper. Cooked until mixture thickened, about 6 minutes. Stirred in 2 1/2 cups shredded roasted chicken, 1 1/2 cups frozen peas (rinsed since they’d been in the freezer so long), and broken up Community Garden dried sage. I used half a box of phyllo with butter softened by sitting in the hot kitchen. Don’t have a pastry brush so used fingers to brush butter here and there between the sheets, and on top, baked in regular oven at 400 degrees for 20-25 minutes, watching the phyllo turn medium brown. 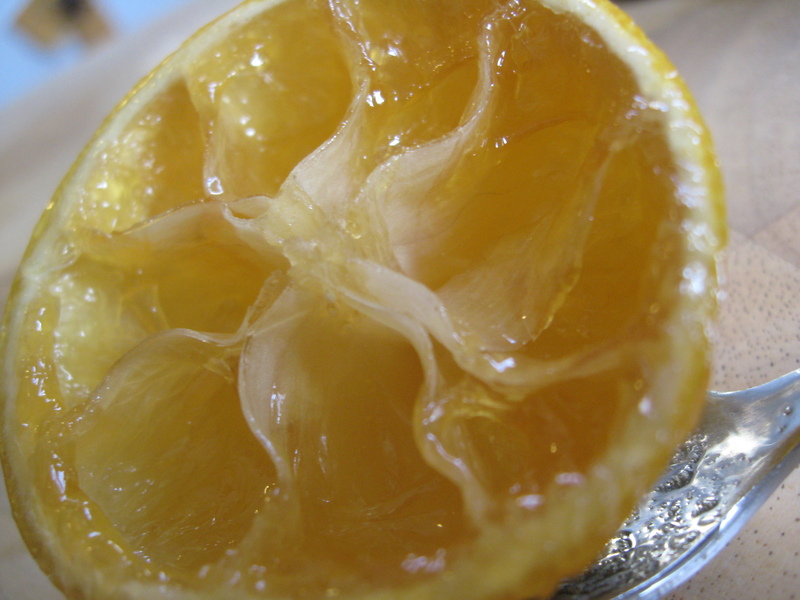 The Baklava recipe came from The Joy of Cooking, and I even had essential oil of Neroli (orange blossom) in my aromatherapy supplies to make the called-for, very dilute orange blossom water. It added a subtle, delicate aroma to the syrup. 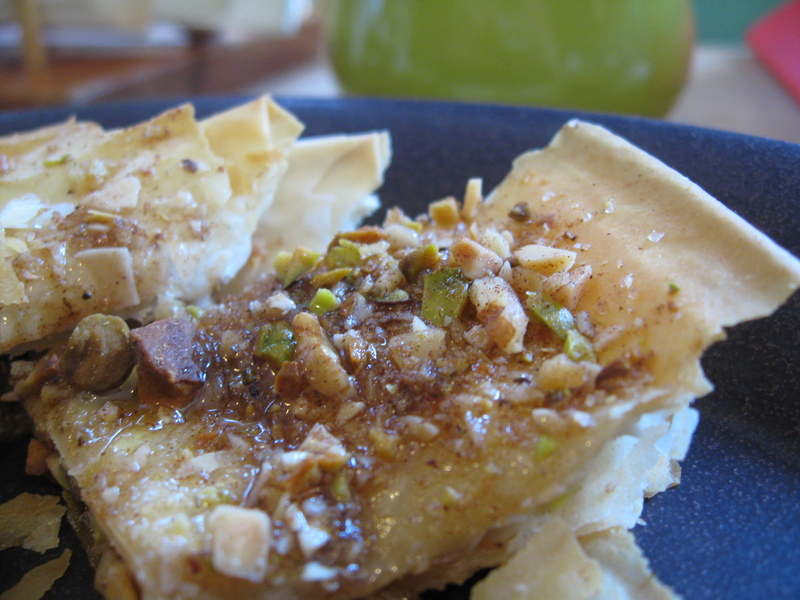 I used local honey, a fresh lemon left from Thanksgiving, half the butter the original called for, cinnamon & cloves, sugar, chopped pistachios, walnuts, almonds–and a half-pound of phyllo dough. This entry was posted in Containing a Recipe, Food, Living in the Moment and tagged baklava, being enough, carrots, chicken broth, chicken pot pie, clearing out, Country Living Magazine, food, household, leftover thanksgiving turkey, lemon, nuts, orange blossom water, Pappadew seasoning, pearl onions, peas, perfectionism, phyllo, plenty, preparedness, recipes, scarcity, self-sufficiency, spanakopita, The Joy of Cooking, women and cooking, writing by of-the-essence blog. Bookmark the permalink.